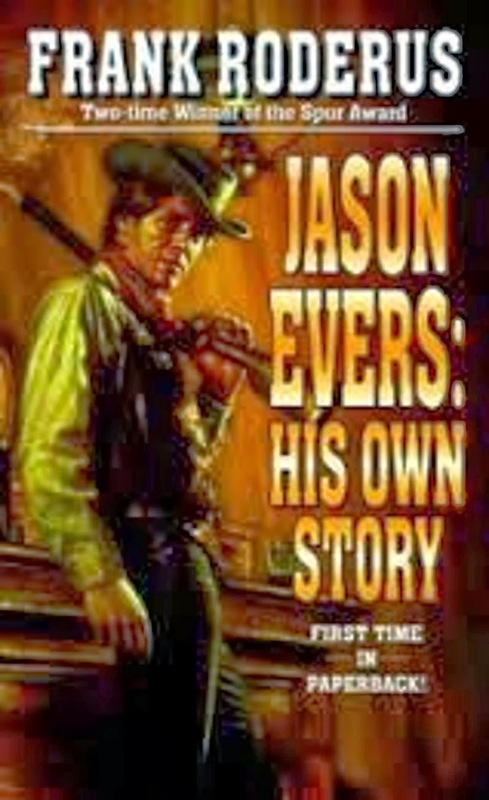 JASON EVERS: HIS OWN STORY was published originally by Doubleday in 1980 as part of the Double D line aimed primarily at the library market, then reprinted about fifteen years ago in paperback by Leisure. 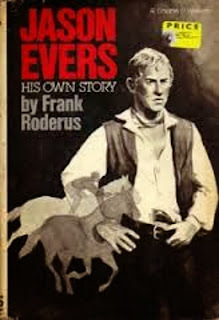 I don't recall ever hearing much about it, which is a little surprising because it's the best novel I've read so far by acclaimed, long-time Western author Frank Roderus. The story opens with a prologue in which the narrator, Jason Evers, is in jail. Declaring that he wants to set the record straight about his life and the circumstances that landed him behind bars, he launches into a tale that takes the reader back to Texas soon after the end of the Civil War, where 17-year-old Jason finds himself on the run from the law, charged with killing a State Policeman. From there Roderus follows Jason on a picaresque adventure that takes him all across the frontier. He travels for a while with an old peddler who teaches him a lot about life. Finding himself in possession of an extremely fast but unimpressive-looking horse, Jason makes his living for several years by matching the horse against others in a series of high-stakes races. The biggest appeal of this book is its remarkable narrative voice. Jason Evers may well be the ultimate in unreliable narrators. He insists again and again that he never shot anybody except in defense of his own life, but he admits that on several occasions he reached for his gun because the other man "had murder in his eyes" and uses that to justify his own actions. He's so blasted wide-eyed and likable that the reader wants to believe him, but the evidence that Jason Evers is really a cold-blooded killer continues to pile up as the suspense mounts. Do we really want him to get away with it? That's something every reader will have to decide. It's cheating a little to call this a Forgotten Book, I suppose, because it's about to be reprinted any day now by the Western Fictioneers Library. But I was so impressed by it that I wanted to post about it anyway. 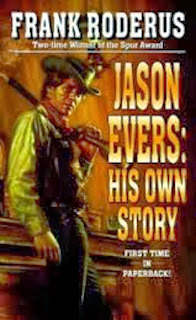 If you're a fan of Western noir, JASON EVERS: HIS OWN STORY is right up there with the work of Ed Gorman, H.A. De Rosso, and Lewis B. Patten. Highly recommended. One of my favorite western novels. I've recommended this one to many folks who've enjoyed it as much as I have. I'm buying JASON EVERS: HIS OWN STORY right now! Sounds great! Just bought a used copy from Amazon. Thank you for the review. Thanks for the review, think I will check this one out. Wonderful review. I have to admit when I saw the title I thought it was a biography of the actor who starred in THE BRAIN THAT WOULDN'T DIE. Yes a grat review. Frank Roderus is so modest and I don't understand why he doesn't list his 300 plus books somewhere on the web. The story of this badman is "something", that you'll not forget. I read more than 1400 westerns novels, but this one is staying in my memory. Yes, it's true, it recalls me some Lewis B. Patten that I like so much, some Clifton Adams too. Congratulations to Mr Roderus for this book.